Police seal off roads near Kenya's Supreme Court in Nairobi, Kenya September 20, 2017. 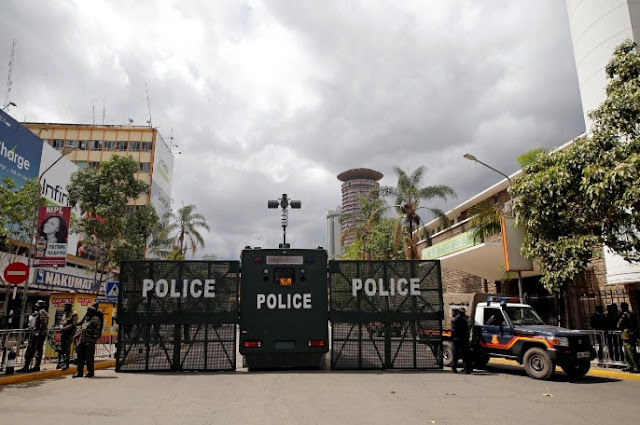 NAIROBI - Police sealed off roads near Kenya’s Supreme Court on Wednesday as judges prepared to deliver a detailed ruling laying out their reasons for annulling last month’s presidential election. Voters are anxious to find out whether the vote was voided on procedural grounds -- the court has already said in its brief Sept. 1 ruling that some tallying sheets were not signed or officially stamped -- or whether there was evidence of systematic rigging. Election board officials had said incumbent President Uhuru Kenyatta won by 1.5 million votes, but that was rejected by opposition leader Raila Odinga, who says the 2017 election -- and the previous two -- were stolen from him. The court ordered a fresh vote to be held within 60 days. Kenyatta promised to respect the ruling although he has repeatedly criticized it harshly. On Tuesday evening, Deputy President William Ruto tweeted: “So has CJ taken sides? Listening to the tone, language & drift of (Chief Justice David) Maraga’s lecture the only phrase missing is NASA HAO! TIBIN! & TIALALA!” -- phrases that are a rallying call for the opposition coalition. Earlier, the chief justice had told a press conference that judges were getting death threats and the police were not offering adequate protection, an allegation that the chief of police denied. Also on Tuesday, police also used tear gas to disperse supporters of the ruling party protesting outside the Supreme Court. In a couple of towns, ruling party supporters used stones to block main roads. Police have said they will disperse any such protests on Wednesday. Police sealed off roads near Kenya’s Supreme Court on Wednesday as judges prepared to deliver a detailed ruling laying out their reasons for annulling last month’s presidential election.